Resiliency has become the word of choice and de facto mantra chanted by USAID administrator Raj Shah. This reflects an organizational shift of focus in its programming in response to the 5-month-old famine in the Horn of Africa (HoA). The word "resilient" carries two definitions, both of which are applicable to the present efforts to alleviate the effects of the ongoing drought in the HoA and ensure systems that prevent future instances of food insecurity. It embodies the aim to bring together short term assistance with long term development. Programming in the HoA seeks to give people living in the region the ability to adjust to the cyclical droughts that return every few years. Feed the Future is one USAID program that hopes to build the capacity to withstand weather challenges. Deliver on sustained and accountable commitments, phasing-in investments responsibly to ensure returns, using benchmarks and targets to measure progress toward shared goals, and holding ourselves and other stakeholders publicly accountable for achieving results. 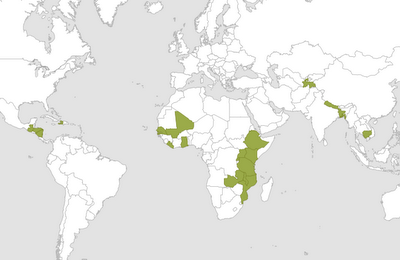 The 20 countries covered by Feed the Future represent some of the world's most food insecure. Notably, the capture in Africa involves the countries currently dealing with the drought in the HoA as well as the Western African countries that make up the Sahel region. While the present focus is on the HoA, it is the Sahel that is starting to draw concerns from the likes of the World Food Programme who warns that Niger, Chad, Mauritania, Burkina Faso and Mali are at significant danger of seeing widespread starvation due to poor rains and high food prices. "Like the Horn of Africa, the Sahel is an area where we need to work in a concerted way to provide resilience for families to avoid famine," said Nancy Lindborg USAID's Assistant Administrator for the Bureau for Democracy, Conflict and Humanitarian Assistance. I had the opportunity to speak with Lindborg after USAID held the two-day "Enhancing Resilience in the Horn of Africa: An Evidence Workshop on Strategies for Success" workshop. The aim of the event was to bring together practitioners and look at ways to bridge relief aid with long term development goals. Administrator Shah spoke at the event and stressed the importance of finding solutions to aligning aid and development. It was made clear that "resiliency" was the way forward for USAID and that sentiment was echoed by Lindborg. "We know that this is a region where droughts come regularly. Our goal is to help communities withstand those shocks without going into a crisis. We can do this by helping people provide for their families through nutrition, better agriculture and a better economy," she said. The ability of Kenya and Ethiopia to avoid famine during the drought is the result of programs implemented by the respective governments. "Huge expanse of Kenya beyond the paved road, area where the drought takes place; those areas are where we have worked on these resiliency programs so those families have now avoided crisis," explained Lindborg. Having aid and development at the same table means that more long term solutions will be embedded into the present relief work. Unfortunately, the lack of governance and structure in Somalia has both contributed to the famine in the south in addition to preventing adequate relief and development solutions to take hold. Looking west, the situation now in Sahel feels much like the Horn of Africa in early 2011. This will be another test for the goal of promoting resiliency in agriculture-based relief. There are plenty of lessons to learn from the HoA famine. The most apparent is the stark difference between how Somalia was affected compared to its better prepared neighbors. Bouncing back is an integral part of resiliency, but like a ball being bounced, the composition matters a lot. Lindborg stressed that the determinant for the resiliency is the countries themselves. She explained USAID as more of a support structure. Keeping with the ball metaphor, the newly constructed material will be determined and forged by the country, not USAID. Doing so is important as it places accountability on national and local governments rather than foreign actors. It is what ultimately builds the connection between aid and development. The issues discussed are nothing new or even earth shattering, but it is still positive to see that big donors looking for solutions that rest within the nexus of aid and development.